The gap between the highest and lowest EU average for a priority is of 41points. At the very bottom is democratic participation. Young people in Denmark were the ones who chose the topic most frequently (24 %) and those in Italy chose it least frequently (4 %). This reflects statistics on the low participation of young people in elections. Yet when young people were asked whether they agreed or not that national governments should strengthen school education about their rights and responsibilities as EU citizens, 89 % of respondents agreed, 10 % disagreed and 1 % were undecided (See Figure 3). This means that practically all the respondents had an opinion on the matter. ‘Don’t know’ was 0 % in seven Member States (AT, EL, IE, IT, NL, PL, and SI), and only in Denmark did the score reach 5 %. 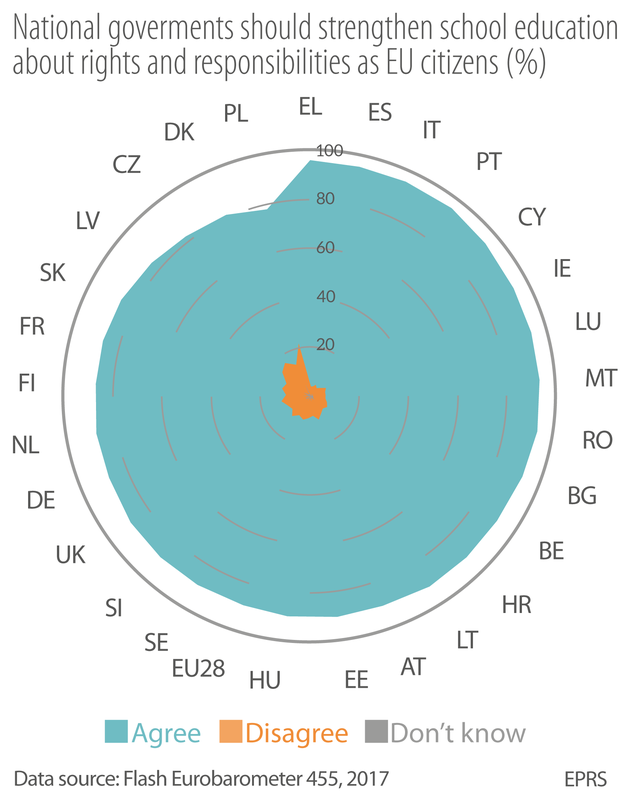 In16 Member States (AT, BE, BG, CY, EE, EL, ES, HR, HU, IE, IT, LT, LU, MT, PT and RO), respondents agreed with the statement at a level of 90 % or higher. Young Poles were the least likely to agree, but their response rate was still 78 %. This tallies with the fact that, despite low participation rates in elections, young people are still interested in politics, but the ‘youth report’ cited above indicates that they prefer to express their views on social media instead.